I’ve gotten patch sharing working reliably between the windows and mobile version of Green Oak’s Crystal synthesizer. These instructions are in an edit of the original instructions at the bottom of this page. Green Oak’s instructions are accurate but assume you know your way around iTunes and Crystal so there are some gotchas. I’ve added some more detailed notes and steps (in red) to help fill in the gaps. Even if you only want to transfer patches from desktop to mobile, I recommend you go through steps 1-3 anyway so you’ll have a bank with the proper name an in the proper format. Exit Crystal XT, connect your iPad or iPhone to iTunes, choose your device in iTunes, and select the "Apps" tab. Exiting the app on the mobile device is crucial. I forgot to do this a few times. Transfer won’t work if the app is running. 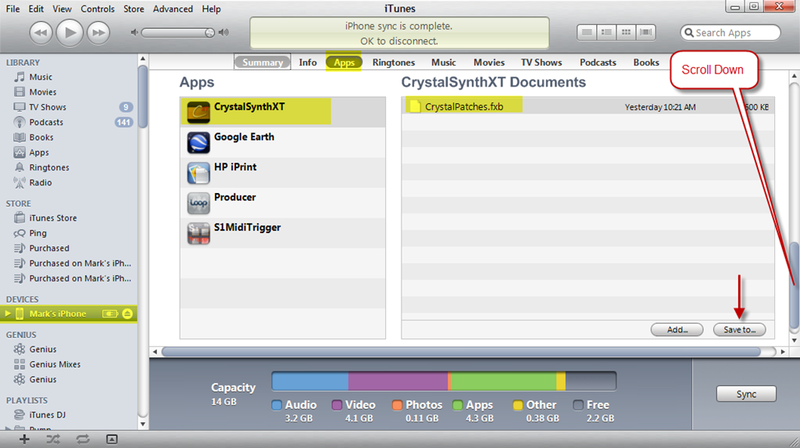 In the File Sharing section of the iTunes window, select CrystalSynthXT. The documents section should show a file named CrystalPatches.fxb. It took me a minute to find this in iTunes so I’ve added this screen shot so show you how to navigate (click to enlarge). At first I could not find the apps as they are below the fold and you have to scroll down. 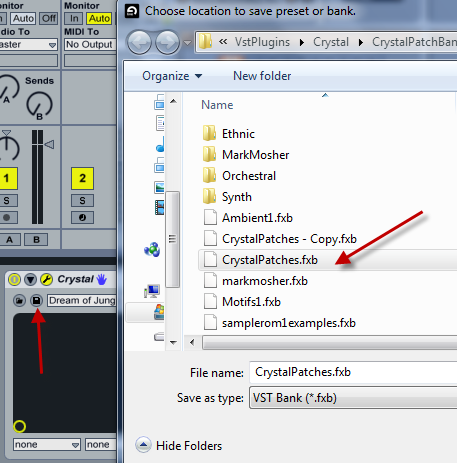 To transfer patches to the desktop version of Crystal: drag the CrystalPatches.fxb file to your CrystalPatchBanks folder. FYI – The folder name must be “CrystalPatchBanks” on Windows for the Crystal Browser to see it. I placed it in the same folder ast the DLL under the vstplugins folder on my system. You can now open the bank in the desktop version via your host patch management system of Crystal’s file browser. Select the patch slot in using the host selector to choose destination location for the patch. 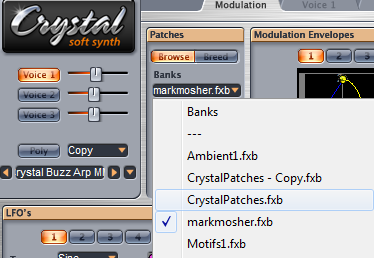 Using Crystal’s patch selector, select the patch you want to move to CrystalPatches.fxb. Use the DAW’s save button to save the bank. If you reload the bank, using your DAW, you’ll see that the patch is no in the bank at that position. 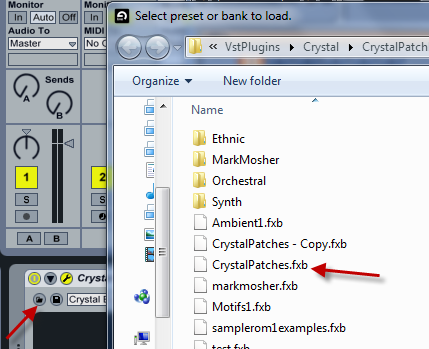 To transfer patches from the desktop version of Crystal: name the fxb file in your CrystalPatchBanks folder that you wish to transfer "CrystalPatches.fxb" and drag that to the Documents section of iTunes, replacing the existing CrystalPatches.fxb. Make sure you exit the app on the mobile device before transferring. After the transfer, restart Crystal to see the patches. Note that the first 125 patches in CrystalXT are factory patches and cannot be overwritten. Your patches will follow the factory patches in the patch list. In other words, patches that don’t use sound fonts should sound the same. 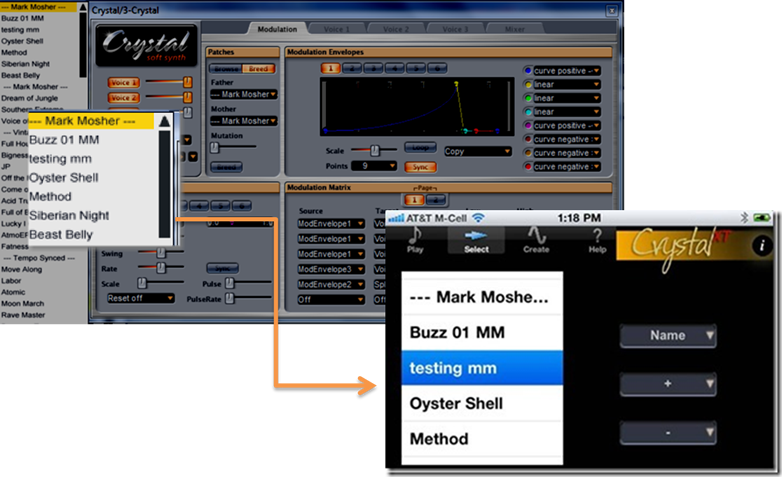 To put this to the test, I recorded an A/B Comparison using three patches 1) Crystal Buzz Arp (a patch I created from init), 2) Method and 3) Full house. In the recording below I play a note on the desktop version, and then the same note on Crystal XT running on an iPHone 4 and recorded into a digital recorder. As you can hear the sound the same and any variance comes from not velocities played. Awesome! So the big win here is you can share patches and they sound the same on all platforms, and you can design patches on the desktop and take them on the go. The iPad version supports patch editing. This is all fantastic from the perspective of getting a mobile device integrated into desktop/laptop digital music production workflow. 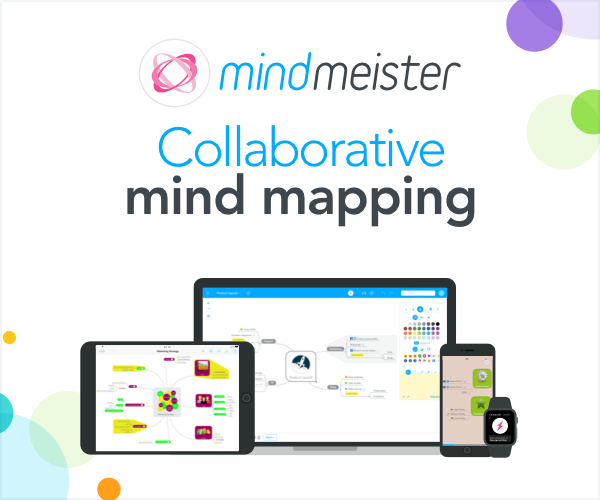 All this is even more impressive when you consider that desktop version is completely free! 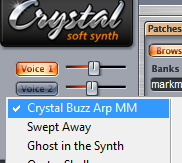 Considering the desktop version is free and the XT version which allows patch sharing is only 5 bucks, it’s kind of a no-brainer for me to recommend you get Crystal into your line up of synths.